The move reflects the government's struggle to achieve its fiscal deficit target of 4.1 per cent of gross domestic product for the 2014-15 financial year. The government has ordered a near 20 per cent cut in its healthcare budget for the ongoing 2014-15 financial year due to fiscal strains, putting at risk key disease control initiatives in the country. 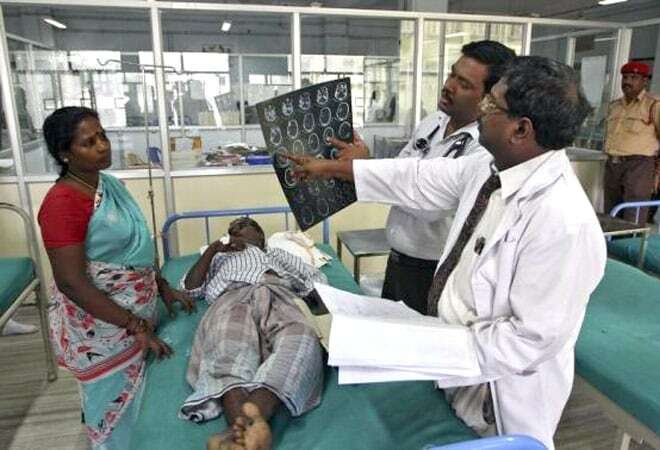 Two health ministry officials told Reuters on Tuesday that more than Rs 6,000 crore (or $948 million) has been slashed from their budget allocation of around US $5 billion for the financial year ending March 31, 2015. Despite rapid economic growth over the past two decades, successive governments have kept a tight rein on healthcare expenditure. The government spends about 1 per cent of the country's gross domestic product (GDP) on public health, compared to 3 per cent in China and 8.3 per cent in the United States. But hopes were high that Prime Minister Narendra Modi would upgrade basic health infrastructure and make medical services more affordable for the poor. "We were not expecting (budget cuts) this time because of the commitments they made in the manifesto," one of the health ministry officials said, referring to PM Modi-led Bharatiya Janata Party (BJP). "No reason was given... But there is shortage of funds. It is not rocket science." The officials spoke on conditions of anonymity because of the sensitivity of the matter. The United Nations estimates about one third of the world's 1.2 billion poorest people live in India, whose public spending on health is already among the lowest in the world. The Finance Ministry, which ordered the spending cut and overruled objections from the Health Ministry at a recent meeting, did not respond immediately to requests for comment. The move reflects the government's struggle to achieve its fiscal deficit target of 4.1 per cent of GDP for 2014-15. Dominated by private players, the domestic healthcare industry is growing at an annual clip of around 15 per cent, but public spending has remained low and resulted in a dilapidated network of government hospitals and clinics, especially in rural areas. One of the health ministry officials said the cut could crimp efforts to control the spread of diseases. More newborns die in the country than in poorer neighbours such as Bangladesh, and preventable illnesses such as diarrhoea kill more than a million children every year. The retrenchment could also derail an ambitious universal healthcare programme that the Prime Minister wants to launch in April. The plan aims to provide all citizens with free drugs and diagnostic treatments, as well as insurance benefits. The cost of that programme over the next four years had been estimated at Rs 1.6 lakh crore ($25 billion). The Health Ministry officials had been expecting a jump in their budget for the coming year, in part to pay for this extra cost. In addition to the healthcare budget, the Finance Ministry has also ordered a spending cut for the country's HIV/AIDS programme by about 30 per cent to Rs 1,300 crore ($205.4 million). In October, the country was on the brink of running out of a critical medicine in its free HIV/AIDS drugs programme due to bureaucratic delays. A crisis was averted with the assistance of pharmaceutical companies and global health organisations. However, health activists still complain about dire shortages of several HIV/AIDS diagnostic kits. "We are all in shock. That shows the kind of importance the government attaches to public health," said Leena Menghaney, a public health activist based in the national capital. "This will undermine the HIV programme in the long run." According to the UN AIDS programme, the country had the third-largest number of people living with HIV in the world at the end of 2013, which accounts for more than half of all AIDS-related deaths in the Asia-Pacific.